Extra! Extra! Read All About It! The Apopcornalypse is Nigh! Extra! Extra! Read All About It! The Apopcornalypse is Nigh! That’s right, you heard me – ‘The Apopcornalypse’. The human race has long fantasised and obsessed over the end of days, having written, sung and even created movies about it. Now it’s time for the perfume world to join in and represent their version of the apocalypse through the medium of olfaction. The punky pop art perfumer lovers over at Etat Libre d’Orange (in collaboration with perfume Quentin Bisch) have created their perfumed version of doomsday – the aptly named ‘La Fin du Monde’ (The End of the World) – centered around the slightly baffling note of popcorn, and for Escentual this week I have put together my thoughts on this judgment day scent. If that doesn’t convince you to head on over to Escentual (by clicking the image above) then perhaps I should say that they are also giving away 5 x 50ml bottles of La Fin du Monde in a special competition. So hurry up, you’ve got a review to read, a competition to enter and a comment to leave! Let me know your thoughts. 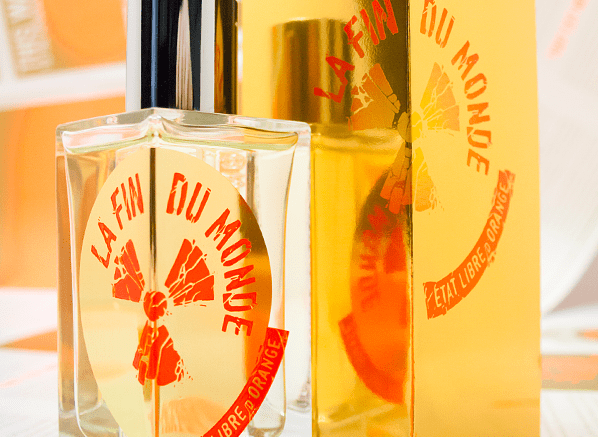 Posted in Escentual, Etat Libre d'Orange and tagged Escentual, Etat Libre d'Orange, La Fin du Monde, Olfaction, Perfume, Pop art, Quentin Bisch, The End of the World. Bookmark the permalink.